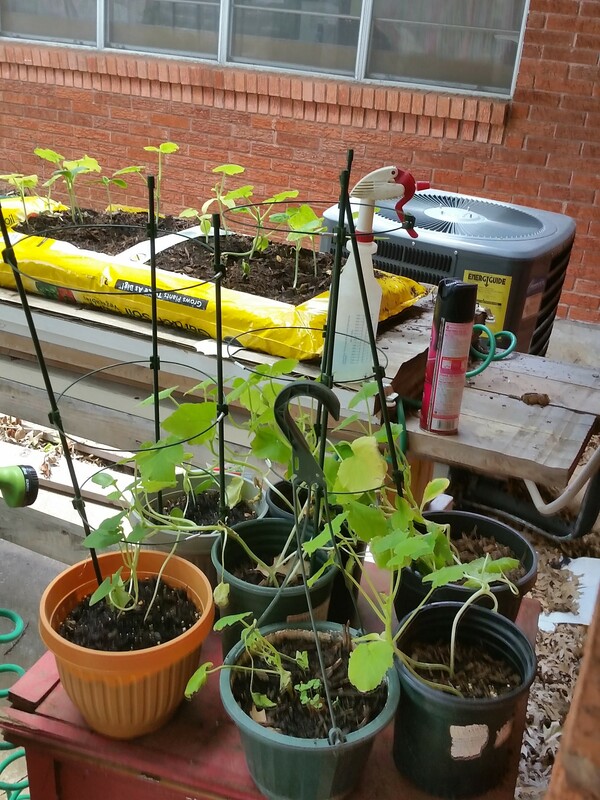 Update on Container Garden, getting rid of pests, and what happened to the seedlings? We are now about a month in for my container garden. I must admit this has been quite the learning experience and still is. I have started having little black ants trying to eat my pumpkins. I tried the soap water, but didn’t really help. I did have a can of ant spray and only sprayed it on the wood surface the plants are sitting on and not on the dirt or the plants. I figured this wouldn’t cause issues with my plants, but would make a barrier for the ants. So far so good, but give them time, they will probably find another way to attack my plants. I am hoping to not go to chemicals, but not sure whether I can do that or not. The other funny thing is how my tomato plant that I have in the upside down planter tried its best to stay growing straight up. It had grown taller than the container bag itself, but I guess it has finally gotten heavy enough now that it is getting ready to bloom that it is starting to come downwards. I figure once it has tomatoes it will have no choice but to hang down, but it sure is giving a good fight trying to stay upright. My other tomato had such issues before it was planted (several arms broke off, the plant fell out of the bag and hit the floor, etc.) it is still looking pretty lean, but it really is trying. It keeps putting on new little leaves, so hopefully in the next few weeks it will finally start looking hearty. My upside down bell pepper was looking so good and starting to bloom, but tonight in my attempt to get the buds to clear the plastic container I snapped off one of the big leaf clumps with the blossoms. I took it straight over to a container of dirt and planted the end about two inches down and then watered it very well. I am hoping it will make roots and live, but that just killed my ability to get peppers here rather quickly, as now it has to grow out another bunch of leaves and blooms. The thing I really do not understand is everything I started in the house as a seedling have all died. I ended up with nothing but one spaghetti squash plant and it isn’t out of the woods yet. I kept the seeds moist until they sprouted and then only watered the seedlings when the soil was dried out. They would sprout and get about three inches and then fall over and die. I have no idea why. I used special seedling mix soil, used the small peat moss containers for seeding, but they just died. Most of the seeds I started outside are doing just fine. There are a few that never sprouted or got only a couple of inches and then died, but for the most part everything I planted outside has grown. I’m not sure if it is the temperature in the house or if the water isn’t really drying out as soon as I thought so I over watered them, or what the heck happened, but I have no luck growing from seeds in the house. Now I’m really good at growing ivy or other house plants that you can plant leaves or put the leaves in water and then grow like crazy. I have an ivy plant in my kitchen window that started as a small plant with only about five leaves that now has so many limbs it has completely covered the window and is now growing up the sides of the cabinets, so it isn’t that I have no green thumb, it jus t seems to be selective in what it can grow. I am just waiting now for my first veggies, as I really want to watch them grow and then having fresh veggies from my own garden. I have heard the taste of fresh veggies is so much better than store-bought, so I am ready to test the theory and see if it’s true. The best thing from this experience is learning what to do different next year. Picking the right seeds, the best containers, and how to take care of the little plants so they are able to grow up and produce veggies or fruit, that is where I want to be with this project, but we will see how my plan goes this time next year. I will either be planting more veggies and fruit, or just buying what I need from the grocery store and saying the heck with it, but I hope I will be gardening again next year. Till next time.